England Exploration: Going to Local Events as a "Tourist"
One thing I like to do when planning a trip is look for what events are happening while I’ll be in a city. I’ve found that attending local events during my trips is a nice way to get a real sense of what living in that place is like. There are always all sorts of events happening if you’re going to another city. The events I tend to look for range from live music, street festivals, live performances, sporting events, tours - some free and some with a small cost. On my last trip to England it was summer and the trip happened to line up nicely with a few international sporting events. For this next trip, however, I am looking more at what bands are playing in the different spots I’ll be in. Maybe I’ll come across a street festival somewhere too but I don’t think I’ll stumble into any internationally known and attending events this time. I try to look things up during my planning before my trip too. This way I at least have a feel for what will be going on while I’m there even if I don’t decide what I’m actually going to or not until later. An easy way of finding local events is just by following the local news/media publications online. Every city has something that is geared towards tourists but also used to share events and news with the locals; Time Out is a big one that has a publication for many places in North America as well as the U.K. and Europe and Asia. There are sites that more specific to individual cities too, such as Visit Philly in Philadelphia and the Londonist in London. Another site I like to look at also is Culture Trip; it has articles and lists of places to go and see that are typically written by locals from whichever city you are looking at. I already have a few things penciled in to my itinerary for this upcoming trip, but check out some of the cool events I experienced during my last trip to England. Check out some of my favorite events that I found while in England back in 2014! I actually was in Wimbledon twice during this trip- we went before it started to just take a stadium tour and see the grounds. I was not expecting at that point that I’d end up actually at the tournament later on! I knew Wimbledon would be going on while I was studying in London but it honestly never occurred to me to try and go until a couple new friends also studying abroad said they were going. 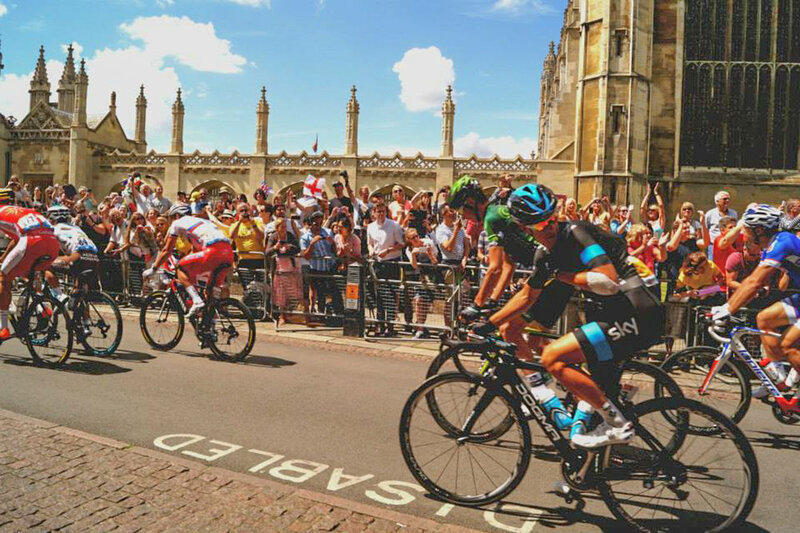 Seeing Le Tour de France in Cambridge, UK was a different experience from watching an event of this scale in any big city like London or Philadelphia. We went out early that day to stake out our viewing spot along the course only to get there and find the locals going about the morning normally with no one worried about staking out a prime viewing spot (yet). It wasn’t until maybe 30mins ahead of start time when the “crowds” began filling either side of the street to see the race go by. We were out there maybe and hour or two before start time because that’s what you would need to in a city like Philadelphia. We did have a great view of the race though! Henley. I still think about how cool it is that I’ve been there. While I was there a spectator not a racer I genuinely enjoyed observing the regatta. Seeing people with the picnic baskets, people having their morning teatime (complete with Champagne) while watching the morning races go by. I took the train from Paddington station and I admit I didn’t fully know where I was going. However I knew instantly after getting on that first train that I wouldn’t be alone. The train was packed with people in their best rowing blazers.